Just a year ago we were a young married couple living your typical suburban, house-and-a-dog, debt-ridden 9-to-5 lifestyle. We had big dreams of quitting our jobs and traveling the world, but we weren’t taking action and didn’t have a plan. Fast forward to today: our house is nearly empty of possessions and there’s a 1996 Chevy Express high top conversion van parked in our driveway. Our new home. The past year has been a whirlwind of Airbnb hosting and working side jobs to earn extra money, selling most of our things (we still have more to sell! ), getting our house ready for renters, and planning to spend at least a year (or two…or more) traveling around North America with a van and two pups. 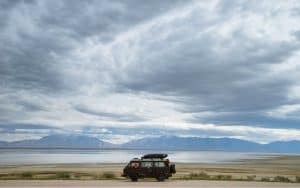 This post is about how we decided to trade in our safe but unfulfilling lifestyle for a life of adventure on the road. We both have a passion for travel. In fact, our entire relationship has been based on adventures and new experiences. We met while serving in AmeriCorps National Civilian Community Corps (or NCCC…It’s really cool, check it out! 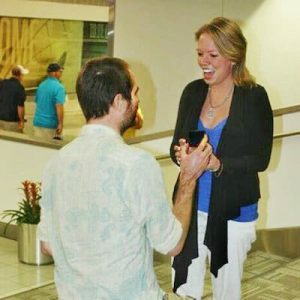 ), a national service program that involves a lot of travel, and we spent the following year in a long-distance relationship traveling around to see each other. Even after we finally moved in together, traveling was a huge priority. We spent three weeks in Southeast Asia in 2012. Our honeymoon was in Ireland. Any time we could get a few days off together, we would hit the road. Friends in Milwaukee? We’re there. Never been to Kansas City? Let’s go! We both had the travel bug, and settling into a stationary lifestyle was not on our list of ideal life choices. But, somehow, that’s what we ended up doing. John moved to St. Louis in December 2011 (he’s from Connecticut) and we got our first place together. It was a tiny one-bedroom apartment, not much bigger than the lobby at a doctor’s office. There wasn’t even space for a dining table, so we would eat dinner on the couch. We didn’t have much stuff, but we were happy to finally be together. John found a job working for a temp agency, and Jayme worked in retail at the mall. After a few months, John fell into a corporate job and Jayme got a promotion. We had gradually acquired more things that we thought we needed, and our small apartment was starting to feel cramped. So we decided to look for a bigger place. We started out looking for two-bedroom apartments so John could have an office, and we found what we thought was the perfect place at another apartment complex nearby. The rent was right at the top end of what we wanted to spend. Then we found out our own apartment complex had a three-level townhouse available for just a little bit more. It was HUGE! Living room and kitchen on the main floor, two bedrooms tucked away upstairs, 1.5 bathrooms, and a half-finished basement. The thoughts started coming right away: Think of all the stuff we can fit in here! 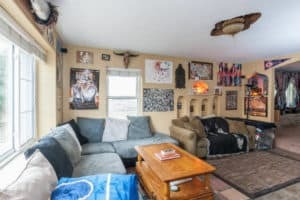 We can turn the basement into a man cave! Dart board, video games, beer fridge, you name it! This would be the perfect party spot! The minute we pulled the trigger on this apartment is when our addiction to “things” truly began. Rather than keep our ratty old futon in the living room, we decided we needed a new couch that “fit better.” So that weekend we went shopping for a new couch and came home with a huge sectional, and of course it was at the top end of our budget. We bought and acquired more stuff to fill up our new place. John’s parents were in the process of downsizing, so they gave us some of their old furniture. Before we knew it the apartment was fully furnished and decorated, and we had more stuff crowding the laundry room, still boxed up from the move. What an adult-sounding idea! What if we bought a house? We could free ourselves from the “rent trap!” And think of how much more freedom we could have if we owned instead of rented! Don’t like that carpet? Tear it up! Wanna put a window there? Go ahead! Almost immediately we found the perfect house for us. Three bedrooms, two bathrooms, garage, nice yard, quirky feel. 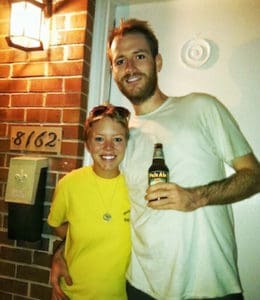 We snapped it up quickly, and we got engaged the very same week we closed on the house. If you have never gotten married before, just keep in mind – you will get a lot of stuff. And we didn’t even have “things” on our wedding registry. We did a travel registry where people could buy us adventures for our honeymoon in Ireland. But we still received juicers, wine glasses, photo albums, home decor, all kinds of stuff. Soon after the wedding, Jayme got a better job and John got promoted. We gradually settled into the suburban lifestyle. We would work overlapping schedules, hang out when Jayme got off work, go to bed, wake up, hang out before John left for work, rinse and repeat. On weekends we would wave to neighbors as we all simultaneously did yard work, then we would get together for a beer afterwards. We spent many evenings watching sports or Netflix or Hulu. We seemed so happy. I mean, we were doing it! Look at us and how adult we are! This is fantastic! Look at all of the things we have! These are ours! And I’m sure we could find space for more things! There was something deep down though, that just didn’t feel right. We were doing something well, but that doesn’t mean we were doing the correct thing well. It was like there was a huge piece of us missing, but we honestly believed we were whole. What If We Actually Did It? We decided we wanted to do one last big trip before we started having kids. We vaguely talked about backpacking Europe for a summer or something similar and were now seriously contemplating it. That was until a year ago when we came across the best living creature we’ve ever met in our lives. We adopted our baby girl Nymeria from Stray Rescue of St. Louis in August 2015 and she changed our lives in all the best ways. We started going to more parks, hiking more often and just plain doing more outdoor activities period, because we wanted her to see things and have fun. Nymeria encouraged us to actually start doing things we had wanted to do and to have healthier lifestyles. In January 2016 Jayme officially quit smoking cigarettes and a few months later John ran his first marathon. She truly is the greatest thing that’s ever happened to us. One day when the work stresses were really getting to us, we resurfaced the “one last big trip” discussion. Since we couldn’t take Nymeria overseas, we started talking about an epic United States road trip so that we could show her the country. It sounded like a great idea! We have friends from AmeriCorps all over the place, we can stay with them, and do Airbnb, and WWOOF, and camp! We decided to set a date. We weren’t 100% sure what we were going to do yet, but we knew if we set a date it would kick our asses into gear and we would HAVE to start moving in some sort of a direction. …But What Do We Do With All Our Stuff? What do we do with all of our STUFF? We thought about renting our house out furnished, or getting a storage unit, or storing stuff with family. But the furnished rental market didn’t seem too appealing, we didn’t want to pay for a storage unit, and we had too much stuff to pawn off on people. This question was a huge mental hurdle for us, a big problem that we needed to solve. And it was holding us back. Without stuff, we wouldn’t need to worry about what to do with everything. We wouldn’t be paying hundreds of dollars a month to store things we don’t use. We’d have nothing tying us down, nothing holding us back from traveling and doing what we really want to do. And selling everything would raise some cash to help us make it further on the road. 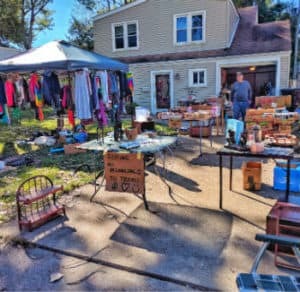 The idea of selling nearly everything we owned was scary at first, but once we got started it was incredibly liberating. We’ll save the details of how we did it for another post, but over the past several months we’ve made thousands of dollars selling decorations, furniture, electronics, books, movies, clothes, and random knick knacks out of our house. We also sold our cars. We were finally taking action and working towards our trip. Even though we had set a date and started working towards it, there were still a lot of questions we had to answer: “How long will we be gone? Where all do we want to go? Both our cars are old and unreliable, what will we drive?” After a lot of discussion we decided: “We’ll be gone for AT LEAST a year. We want to go everywhere we can. We’ll get a used Toyota RAV4,” which seemed like a great combination of space, reliability, and fuel efficiency. We would fantasize about it and how much fun it would be, but then one of us would inevitably shoot it down. “It just doesn’t make sense. We don’t have the time. It would never work.” Common phrases anyone who is afraid of success has heard far too many times. We were days away from pulling the trigger on a RAV4 when Jayme came across @wheresmyofficenow on Instagram. She clicked on one of their many stunning photos of them in the middle of the woods with their dog and van. 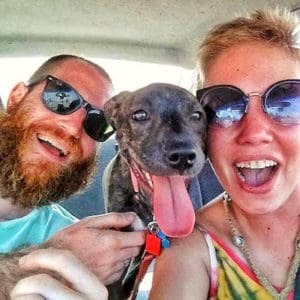 It had the hashtag #homeiswhereyouparkit, and as the true nature of Instagram goes she kept clicking and scrolling through all of these photos of people having a blast living out of their vans. 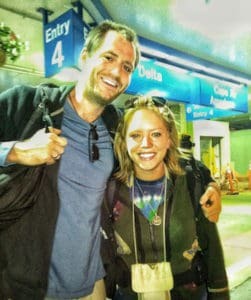 Jayme remembers feeling like reality had smacked her across the face, and she looked up at John and mumbled something like, “What if we…DID…live in a van?” John of course turned around and gave Jayme his “finally” smirk as if she gave him permission to buy a new musical instrument. That day we became Craigslist-aholics. We searched “van,” “conversion van, and “class b rv.” We searched surrounding cities and places hours away. We refreshed our browsers every few minutes hoping for new listings. 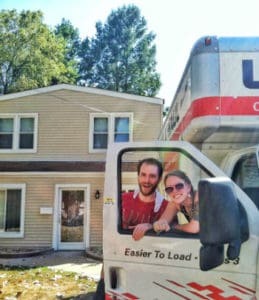 We were searching for the perfect van that was either ready to go, in perfect shape, or cheap enough for us to be able to have extra money to fix it up. 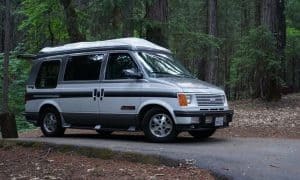 The biggest struggle at first was deciding if we wanted to convert a van from scratch or buy an already converted vehicle like a small Winnebago or something similar. We would be exhausted from looking and not finding anything, and then an old Roadtrek would fall into our laps and we would be so excited about the idea that we could just hop in and go that day. But we eventually decided against buying something all ready to go. We wanted to fully engross ourselves in the whole experience. We wanted to choose where to put the bed, what the cabinets are made out of, where to put the bathroom – or if we even wanted a bathroom in the first place. 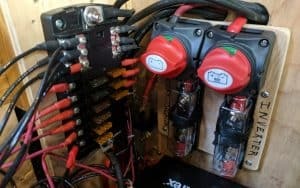 Building out our van from the ground up was a terrifying thought because of our lack of experience with electrical work, plumbing, and vehicles in general. But it was also incredibly exciting. And we decided that it would be the best way to learn and understand our new home. If something’s going wrong with the sink, we would have a better idea how to fix it than if we inherited someone else’s problems in a ready-made RV. 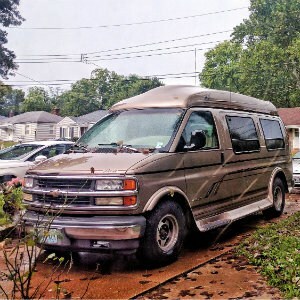 After a lot of patient searching we finally found our vehicle, a 1996 Chevy Express high top conversion van with a wheelchair lift. It was located a little over two hours away in Illinois, and the woman who owned it was super sweet. It was her father’s van, he had passed away last year, and she just wanted to get rid of it. Some delays, inspections, repairs, negotiations and trips to Illinois later, we finally had our new home parked in our driveway. It was time to get to work. What was always a dream for us is now becoming a reality. We are excited to embark upon this journey, to join the growing community of modern nomads and to live creatively again. 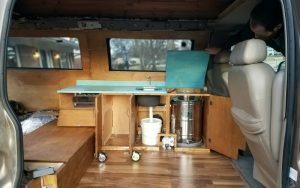 Stay tuned for more posts and updates on our van build and travels, and be sure to follow us on Instagram @gnomad_home and Facebook at Gnomad Home. We look forward to sharing our adventures with all of you!